The Coca-Cola Company and Ford Motor Company are fueling more sustainable design by collaborating on a first-ever interior fabric made from the same renewable material used to produce Coca-Cola's PlantBottle Technology packaging. 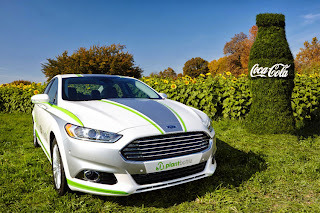 unveiled a Ford Fusion Energi plug-in hybrid vehicle with Coca-Cola PlantBottle Technology interior fabric surfaces covering seat cushions, seat backs, head restraints, door panel inserts and headliners. The research vehicle marks the first time PlantBottle Technology is applied beyond packaging, and affirms a joint commitment by two global consumer icons to develop innovative new products produced from renewable materials. "By using PlantBottle Technology in a plug-in hybrid, Ford and Coca-Cola are showing the broad potential to leverage renewable materials that help replace petroleum and other fossil fuels, reducing the overall environmental impact of future vehicles," said John Viera, Global Director of Sustainability and Vehicle Environmental Matters at Ford. The collaboration also demonstrates the positive influence that comes from combining two of the most recognizable and respected brands in the world. The Cola-Cola Company and Ford Motor Company together reach billions of consumers in more than 200 countries on six continents. The Ford Fusion Energi research vehicle will be on display later this month at the Los Angeles Auto Show. The idea behind the vehicle was launched last year when Ford and Coca-Cola research teams came together to explore innovation opportunities in more sustainable products. Both companies use PET, a durable, lightweight plastic also known as polyethylene terephthalate, in a variety of products including plastic bottles, fabrics and carpets. This provided a natural opportunity to bring together both recyclable and renewable technologies. "This collaboration with Ford demonstrates that PlantBottle Technology can be applied anywhere PET plastic is traditionally used, but with a lighter footprint on the planet," said Scott Vitters, General Manager, PlantBottle packaging platform, The Coca-Cola Company. "We are pleased to share this technology with Ford, and look forward to continuing to expand the application of PlantBottle Technology."